Celebrating the new arrival of baby or announcing the new little one. With a bit of fun, personal style and whimsical designs these personalized buttons are adorable accents for your important and memorable event. If you are hosting a baby shower, fill baskets and bowls with bundles of buttons to set out on your party favor table or put in the gift bag. 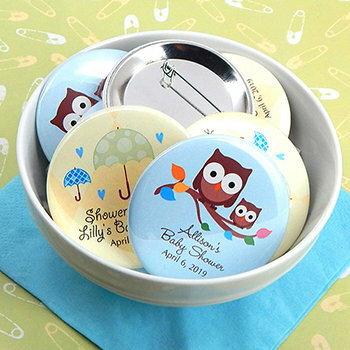 Buttons are 2.25" in diameter, personalized with three lines of text and you can choose from dozens of designs, from traditional to whimsical. They are easy to attach and safe for most types of clothing fabric. Our glossy buttons are ready to wear, so no assembly is needed.